RBTH presents a selection of views from leading Russian media on international events, featuring analysis of the results of Ukraine’s parliamentary elections and the probable shape of the new parliament, as well as a report on whether EU sanctions against Russia over Ukraine are likely to be lifted in the near future. The Kommersant daily reports on negotiations to form a new parliamentary coalition in Ukraine based on the Petro Poroshenko Bloc and Arseniy Yatsenyuk’s People’s Front, representing the current president and prime minister, respectively. The Samopomich [Self Reliance Party – editor’s note] might also join in. According to the newspaper, Yatsenyuk will keep his post as prime minister, although it remains to be seen who will be the new parliamentary speaker. The official leader of the Petro Poroshenko Bloc, Yuriy Lutsenko, has his eye on the post, Kommersant writes. The deputies elected in majority districts will have a significant say in what the Verkhovna Rada, or parliament, looks like and whether it will be oriented towards continuing the conflict in the east of the country or forging a lasting peace. In conversation with Kommersant, Kiev-based political analyst Dmitry Dzhangirov predicts that nearly a third of the Rada will remain outside of factions, while deputies from majority districts will either be able to create new parliamentary groups or remain independent and vote based on each individual case. Kommersant reports that Moscow has expressed its readiness to recognize the results of the elections but has noted that “aggressively anti-Russian forces” have secured much greater representation in the Rada as a result. In another article, Kommersant reports that the European Union is very unlikely to cancel the sanctions against Russia any time soon. The EU adopted nine packages of anti-Russian sanctions affecting 119 individuals and 23 companies back in the spring. It also imposed restrictive measures against the Russian energy, finance, and defense sectors. According to sources in European structures, the main problem is that the EU lacks a clear mechanism to cancel the sanctions. 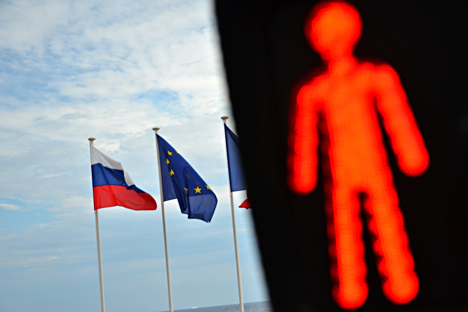 Kommersant believes the sanctions will remain fully in place until mid-March 2015. In order to prolong them, the EU countries will have to adopt a unanimous decision, but that is very unlikely to happen. “If the situation in Ukraine remains more or less stable, Finland, Austria, Italy, Bulgaria, Slovakia, Greece, Cyprus, Luxembourg, and possibly other countries will certainly vote against prolonging the sanctions in full in March,” a European official told the newspaper. Nezavisimaya Gazeta writes that the results of Ukraine’s snap parliamentary elections came as a surprise to all, with the Yatsenyuk-Turchynov-led People’s Front unexpectedly coming in second. The newspaper names low voter turnout as one of the possible explanations. The results enjoyed by the People’s Front are also testament to public sympathy towards Prime Minister Arseniy Yatsenyuk, whom Ukrainians did not previously view as a national leader. However, sources interviewed by the newspaper see this situation as highly problematic for Ukrainian President Petro Poroshenko. An informed source told Nezavisimaya Gazeta that “a black cat ran between [Poroshenko and Yatsenyuk] long ago;” that is, they don’t see eye to eye. The Ukrainian president has leaned towards solving all problems through dialogue – even with Russia – and has shown that he is willing to be flexible, the source said. Yatsenyuk, however, sticks to the American line, which is not particularly flexible.